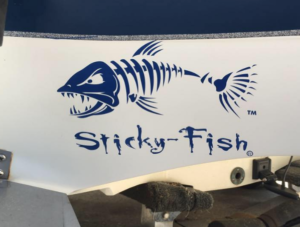 This aggressive fish decal will put your boat and kayak on display, easily install it to your back windows and boat hulls. Our logo is edgy and sassy! A favorite from salt and freshwater fisherman customers! All our decals are made from high quality decal vinyl, and are designed to endure the intensity of both salt and sun! Plus, your bright colors won’t fade! When applied to smooth, clean surfaces like coolers, windows, boat hulls and kayaks, these decals will last 4 – 5 years! 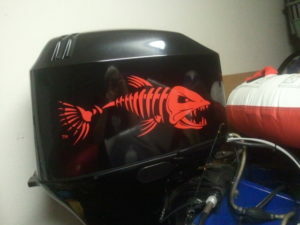 All decals are produced in-house by Sticky-Fish. Our customer saw this decal and immediately purchased the 18″ red aggressive fish left and right facing to be sure his motor was seen by all on the water, this aggressive design is eye catching and awesome!